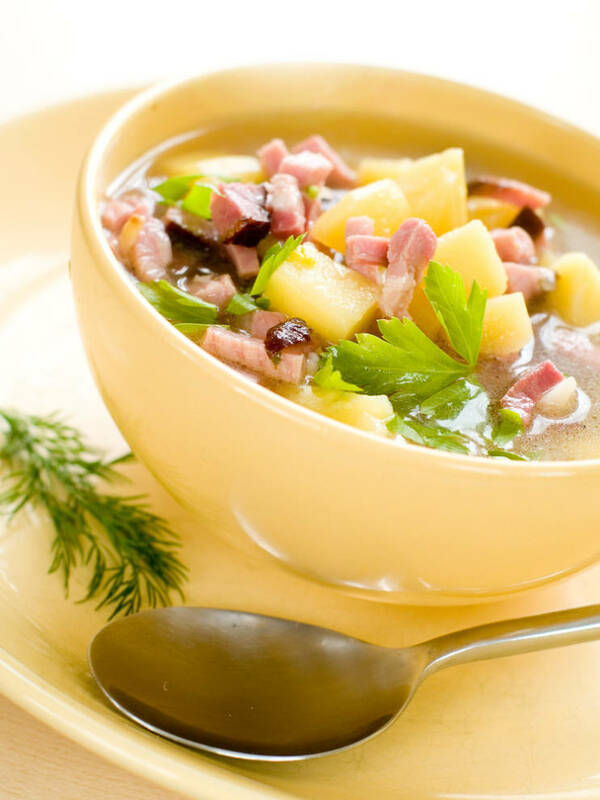 This recipe for potato and ham soup makes 8 servings and is perfect for a cold winters day. The thing I like most about this soup is you can add additional ingredients without worrying that the recipe will be spoiled. I have made it numerous times and have found you don’t need to peel the potatoes just wash and dice them. I also don’t add any extra salt. If you like your soups a little thicker then just mash some of the potatoes. Serve with a crusty Italian bread or just by itself. Combine the potatoes, celery, onion, ham and water in a stockpot. Bring to a boil, then cook over medium heat until potatoes are tender, about 10 to 15 minutes. Stir in the chicken bouillon, salt and pepper. In a separate saucepan, melt butter over medium-low heat. Whisk in flour with a fork, and cook, stirring constantly until thick, about 1 minute. Slowly stir in milk as not to allow lumps to form until all of the milk has been added. Continue stirring over medium-low heat until thick, 4 to 5 minutes. Stir the milk mixture into the stockpot, and cook soup until heated through.